“Lo, children are an heritage of the LORD: and the fruit of the womb is his reward. As arrows are in the hand of a mighty man; so are children of the youth. Happy is the man that hath his quiver full of them: they shall not be ashamed, but they shall speak with the enemies in the gate” (Psalm 127:3-5). A heritage is usually tangible like money or an estate. It’s inherited from someone else. Reward means something is given such as money or a trophy for doing good or winning a contest of some kind. God calls children a heritage and a reward. They are gifts from Him. They are to be valued and treasured above all the stuff this world has to offer. Happy is the man who has a quiver full of children! Many in our culture try to shame men and women if they have more than one or two children. “You’re overpopulating the earth.” “Don’t you know how to prevent those?” They value the creation over the Creator. 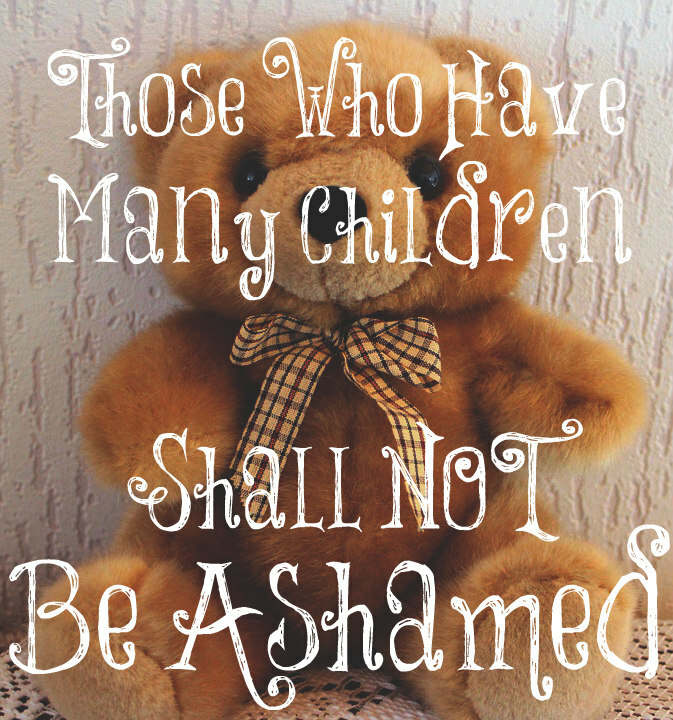 God tells parents of many children that they shall not be ashamed! Children are blessings from the LORD! “Thy wife shall be as a fruitful vine by the sides of thine house: thy children like olive plants round about thy table.” (Psalm 128) Have you seen a fruitful vine by the sides of a house? It’s usually full of flowers that eventually produces fruit and is beautiful! This is how a wife is described who is open to marrying and bearing children. God calls this good! The children shall be like olive plants around the table. Another good thing! I looked up the characteristics of olive trees. They are known for their longevity. They’re prolific, indestructible, unparchable, ancient, and sacred (the olive branch). I love that God equated children with olive plants! All the stuff that we are accumulating, the trips we take, our college degrees, our careers, the money we may make, and the things we do are NOTHING in comparison to having children; for they are eternal souls who will last forever. Godly offspring are indestructible! If raised in godly homes to be Christians, they won’t be affected by our wicked culture because their roots will go deeply into the Word and they will live eternally with the LORD (unparchable). They are the gifts that keep on giving by giving us grandchildren and great grandchildren (prolific). They are gifts from God (sacred). God knew them from the foundation of the world (ancient). God in His Word has only good things to say about children. It’s His will for married couples to have children and have a quiver full, if they are blessed with them. This is completely opposite of what the world is telling women to do. This shouldn’t surprise us. The prince of the power of the air (Satan) holds many captive in this world and lives to deceive women away from God’s will. He hates marriage. He hates children. He especially hates godly families. 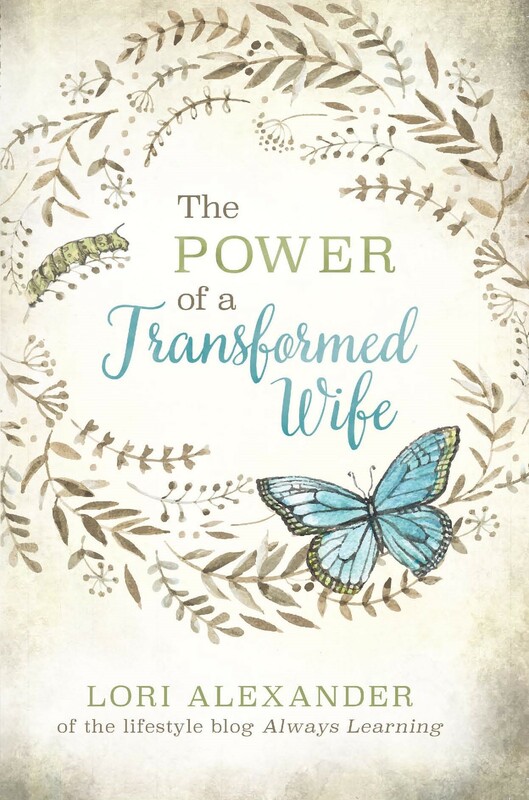 God’s will for young women is to “marry, bear children, and guide the home” (1 Timothy 5:14), to love their husbands and children and be keepers at home (Titus 2:4, 5). It’s a good will, women. In fact, it’s good, and acceptable, and perfect for you! Why would any godly women want anything other than God’s will? A big family can indeed be a blessing in old age, when you are surrounded by your children and grandchildren! My mom came from a family of 4 children, she the youngest. My grandma, her mother, in her old age had 4 loving children doting on her, and caring for her, and grandchildren too! She died happy amongst the love of her family. Raising a lot of kids is very hard work I’m sure, but worth it once you raise upright moral human beings to help spread goodness and kindness in this very much selfish entitled world! We need more people being raised to value traditional virtues of family and selflessness, unlike the “anything goes, I can do whatever I want regardless of who I hurt” mentality pushed on our next generation today. That said, I will add the caveat that you should not just keep popping out kids indefinitely that you will not be able to provide for financially, and yes, emotionally. Mommy’s attention, unlike mommy’s love, is finite and each child deserves to be loved and nurtured individually. Daddy’s wallet only stretches so far… Have as many as you can, surely, but it’s not moral nor ethical to have more mouths than you can feed, clothe, shelter and care for. Each family is different and the number of children they choose to have must be best for their financial and emotional resources. What I don’t like, however, are those who will judge women for wanting to mother many children. After all, what greater calling can one have have than to raise the next generation of righteous moral people to help turn the tide against today’s rampantly entitled selfish culture??? As you probably know, my mom died in August. An older, godly friend of mine told me that she had never seen a woman more loved on her death bed than my mom. Her favorite thing was to have all of her great grandchildren over, hobble to the room they were playing on, and watch them play. She invested her life into her family and reaped the beautiful fruit of doing so. No, she had no college education nor career but she had what truly matters. Love and family. Being able to provide for your family financially is a relative thing and is often used to justify having fewer children. Some people believe you should be able to finance your child’s college education and that you should only have as many children as you can put through college. Other people, well meaning and with good intentions, believe that you should only have as many children as you can give attention to. What if you feel you can only give attention to one child (I know people who feel that way.)? That, too, is relative. However, God never tells his people to only have as many children as they can handle but he says to be fruitful and multiply. He wants us to trust him and not our financial or emotional ability. I understand what you are saying and where you are coming from, but that reasoning is exactly the world’s reasoning with regard to why one should have fewer children. I absolutely love seeing large families out and about. When I see them, I just smile. I know that society condemns couples with large families and accuse them of being irresponsible. I thank the Lord for Christian couples who are willing to let God to bless them with many children. We wanted many children but God saw it fit to bless us with only three and we are content with His plan. Here is Southern CA, we see very few large families. My oldest daughter lived in Mississippi for a while in her early twenties and saw many large families and always raved about how well-mannered and well-behaved they were. They were all homeschooled families who believed in the value of life. We wanted many children, too, Regina, but thankfully, we were able to have four. After my fourth, I became very ill for many years so we are VERY thankful that we didn’t put off childbearing for my career as many are doing today. I am always encouraging young women to not take advantage of their fertility and put off having babies. It steeply declines with age. So truthfully told! When I was younger and having my children I was always ask ..are you going to have more children? How will you pay for them? Then others would make the rude remarks don’t you know what stops that! I know what you guys do all the time! You are your husband are truly blessed, Karla. None of the “blessings” this world has to offer can compare with the blessings of children. My DIL just had her fourth baby and this baby’s siblings were jumping up and down with glee when we took them to meet her. I remember reading that the best gift we can give our children is another sibling! What a shame motherhood had been deemed oppresive by the radical feminists! Sad! Yes, they are the ones being deceived and missing out. Often, they realize it too late, in their older age. God has always been faithful but now our financial situation has turned around and alas we cannot have any now. I constantly tell my kids my mistake but…..it still doesn’t give me any more sweet babies. I regret we ever used birth control in the first place. We probably missed having another baby before our first. No one was telling us to get married and bear children right from the get go. No, we must have time to finish our college education and have a career, even though it wasn’t what I wanted at all. I have 10 kids, (aged 15,almost 13,11,10,8,7,6,4,2&9 months, G, B, G, B, B, B, G, G, G, G.) Its tough but a blessing at the same time. Comments no longer affect me. Particularly when I reminded myself it was just ignorance motivating them to make those comments. The only thing I would change is the way I raised them. I see many areas where I failed. Thankfully, theLord makes up for it. I only have two children I wish I could have had more! I was 26 when we got married and had difficult pregnancies, leaking amniotic fluid in my last pregnancy and was on bedrest for several weeks, so my husband decided that our 3rd would be the last. I was disappointed not to have more, but I’m grateful for the ones we have. Children are a blessing! In 1947, when there were about 140 million Americans, there were 3.6 million babies born. 70 years later, in 2017, when our population was over 330 million, there were only 3.8 million babies born. In 1947, of the 3.6 million babies born, 3.6% were born in homes without a married father. Last year, 39.8% were born in homes without a father. I remember being at the market with a friend of mine. We had her 4 kids (under 10) with us and she was pregnant. She stopped at the checkout and there were 2 young women in line. In response to her question to the clerk about where something was, one of the women said, “You might wanna ask where the birth control is, too.” My friend didn’t even flinch. I, on the other hand, felt my face turning red because I was SO furious. I couldn’t believe anyone would be that rude. She later told me that it happened more often than you’d think. And this was back in the early 90’s. I remember stewing about that for weeks. I imagined myself telling them what a great mom she was, how she homeschooled, volunteered, had a beautiful home, was a Girl Scout leader, etc. And I later realized that none of it would matter to them….they were too ignorant to understand. Maybe the spam filter ate my comment? Not all children are a blessing. Not because having a child is a burden, or expensive, or whatever, but because that child grows up unregenerate and causes his parents much grief. See various bits of Proverbs. This is not an argument for birth control, of course, but for good and godly parenting.